The Sounders held out against RSL long enough to make it to penalties, where GK Tyler Miller came up big to help Seattle advance to the U.S. Open Cup quarterfinals. It took 120 minutes and penalties, but the Seattle Sounders held on at Rio Tinto Stadium Tuesday to draw Real Salt Lake, 1-1, before advancing on penalties 4-1 to reach the sixth round of the U.S. Open Cup. 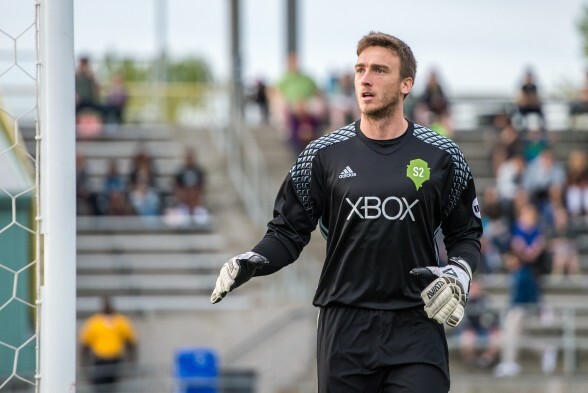 Tyler Miller made two saves in the penalty shootout to help Seattle advance to the quarterfinals. The Sounders fielded a backup-heavy lineup against RSL, though anchored by the presence of Nelson Valdez at striker and Zach Scott at centerback. Seattle went down a goal in the 41st minute, when Joao Plata converted a penalty after Tony Alfaro fouled Yura Movsisyan in the box. The Sounders equalized early in the second half, when Valdez converted, despite losing his feet chasing a bouncing ball that had drawn Real Salt Lake keeper Jeff Attinella out of net. From there, the Seattle was forced to hunker down as the altitude and pace of the game dragged them down. RSL outshot Seattle 30-16. In extra time, RSL bore down. Desperate clearances and clock-burning delays were enough to send the match to penalties. After 120 minutes, many Sounders players collapsed to the ground in exhaustion. Herculez Gomez stepped up first for Seattle, smashing his effort into the roof of the net. Juan Martinez equalized, rolling a ball to the left side of the net. After Jordan Morris beat Attinella to the right side of the net, Joao Plata stepped up to take his second penalty of the night. Miller dove to his right, extending a hand upward and tipped Plata’s effort over the bar. Zach Scott turned up the heat, netting his ball to the right side to make it 3-1 as Kyle Beckerman walked up to take Real Salt Lake’s third penalty. Miller dove right against Beckerman, trailing his leg just far enough to get a shin to Beckerman’s shot down the middle. Erik Friberg made the most of his chance to finish the match. Friberg put his ball straight down the middle as Attinella dove right. With the win, Seattle will face the winner of Wednesday’s match between the Portland Timbers and the LA Galaxy. Regardless of opponent, Seattle will travel in the competition’s quarterfinals.